Davies HTO, Nutley SM, Smith PC. What Works? Evidence Based Policy and Practice In Public Services. Bristol: The Policy Press; 2005. Pour Shirvani SN, Mouodi S. Evidenced-based in policymaking in health system and its achievements and challenges in Iran . Babol: Babol University of Medical Science; 2013:37. [Persian]. 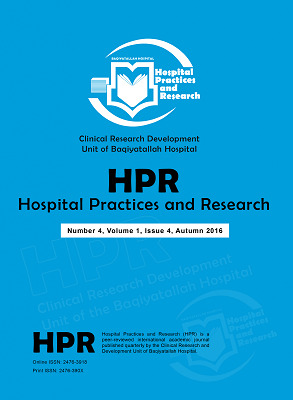 Asefzadeh S. Management and Hospital Research. Qazvin: Qazvin University of Medical Science Publication; 2003. [Persian]. Mosadegh Rad AM. Principles of health care services administration. 1st ed. Tehran; Tehran Dibagaran artistic and cultural institute; 2003:562-563. [Persian]. Ministry of Health and Medical Education. Drug and treatment deputy Instructions about hospital committees. Tehran: MoHME; 1997:181. [Persian].